A recent theme here has been to subject to scrutiny well-known mechanisms supposedly involving intermediates. These transients can often involve the creation/annihilation of charge separation resulting from proton transfers, something that a cyclic mechanism can avoid. Here I revisit the formation of an oxime from hydroxylamine and propanone, but with one change. In the earlier post, I used two molecules of water to achieve the desired proton transfer. Now I look to see what effect replacing those two water molecules by a guanidine has. As become evident when I looked at ester hydrolysis, water is a very weak acid/conjugate base, and so the barriers for reactions mediated by pure water tend to be high; catalysis by pure water in other words is slow. The barriers are lowered considerably if the two water molecules are replaced by a species better able to stabilise a (charge separated) intermediate, such as guanidine. So here I re-investigate the oxime mechanism with this base (ωB97XD/6-311G(d,p)/SCRF=water). The IRC profile for the 2H2O catalysed O-nucleophilic addition (red arrows above) reveals a concerted and largely synchronous addition combined with proton transfers along the water chain. Look at the difference when guanidine is involved. The barrier drops from ~24 kcal/mol (a very slow reaction at room temperature) to ~11 kcal/mol (a very rapid reaction). A similar drop was noted for the hydrolysis of methyl ethanoate. But there is a more significant difference. With guanidine, “hidden intermediates” are revealed. The transition state of course is marked by IRC=0.0, but soon after at IRC -2.0 the gradient drops, almost but not quite to zero. This is the characteristic signature a “hidden intermediate”, an effect induced by the guanidine. However, at IRC -3.0 the second proton transfers from the conjugate acid of guanidine (a “hidden” guanidinium cation) to the erstwhile oxygen of the carbonyl group (a “hidden” oxyanion), resulting in the creation of the tetrahedral intermediate in this reaction. The IRC profile for the preferred N-nucleophilic addition (blue arrows) is shown below. Again, the 2H2O reaction shows no trace of a hidden intermediate but the guanidine route clearly does. The (apparent) barrier decreases from ~8 kcal/mol with water to ~2 kcal/mol with guanidine, and overall is 2.7 kcal/mol lower than for O-nucleophilic attack. There is a final feature. Propanone and hydroxylamine in the presence of guanidine form a “pre-complex” (an un-hidden intermediate), with an intriguing distance of 1.619Å between the carbon of the carbonyl and the nitrogen of the hydroxylamine. 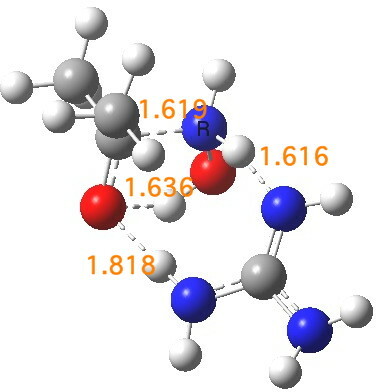 This initial tetrahedral species is locked in by a network of unusually short hydrogen bonds and has a barrier to its formation from the uncomplexed two reactants of ~3 kcal/mol (and a barrier onwards to the formation of a second tetrahedral intermediate of ~2 kcal/mol as we saw before). So here ist a more complete picture of how an oxime forms from propanone and hydroxylamine under the influence of a more potent catalyst than water. The barriers are significantly reduced by the use of guanidine. before settling into a final tetrahedral intermediate resulting from a second proton transfer, with the two proton transfers being part of a concerted asynchronous mechanism. This entry was posted on Sunday, April 14th, 2013 at 7:26 pm and is filed under Interesting chemistry. You can follow any responses to this entry through the RSS 2.0 feed. You can leave a response, or trackback from your own site. Intermediates in oxime formation from hydroxylamine and propanone: now you see them, now you don’t. is licensed by Henry Rzepa under a Creative Commons Attribution-Noncommercial-Share Alike 3.0 United States License.